Yesterday my son came home with some jigsaw puzzles that he found on the street. Ten of them, with the pieces all in closed plastic bags. And some board games, two souvenir dolls and a video, about Herman Brood, Rock’n’roll junkie . Of cause we have to get rid of al this stuff. Our kids never do jigswaw puzzles and the house is already way to full. But I think I keep the video. 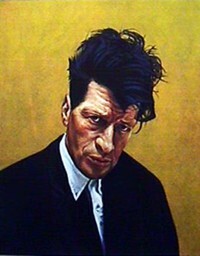 Herman Brood was called the only real Dutch popstar. He killed himself a few years ago by jumping of the Hilton Hotel, which was a strange end to a strange life. Herman was an enigma, combining several careers and a family life with a life long addiction to speed and alcohol. Considering the devastating effect that speed and alcohol have on people that used only a portion of what Herman consumed in his life, he did very well. 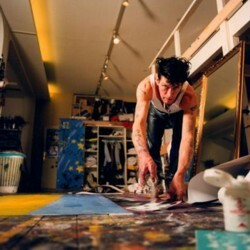 I don’t know how he was as a father or a husband, but as a musician, a painter and an actor he produced many things that I find very inspiring. I have bought almost all of his records (and did away most of them) and saw him on stage many times. What I loved about him was that no matter what he did, he always tried to make some special of it. He was constant living it up, in the most literal meaning of the word. Especially in interviews he was at his best. There were years when I heard him being interviewed on the radio several times per week, but he was never boring and always said things that made me think. After he died there have been re-releases of his LP’s and other material. But so far there is not yet a CD with all of the rarities, like this song that he sang in a radio show. I cannot remember the name of the show, nor the date. There must be enough material like this to fill a complete CD. All you need is a person who would like to go through al the archives. Hm, I can think of such a person! 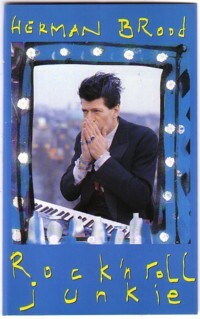 Herman Brood is also featured on the CD Dutch Rare Groove, with a song that he recorded with Vitesse. In case you have missed this CD, it worth checking it out. gaan we nou ruilen of niet? Ik ben een beetje de draad kwijt. Wat kan ik voor jou doen? Ik heb jou vlak na mijn bericht een mailtje gestuurd maar niks op vernomen, vandaar dat ik ervan uitging dat je andere prioriteiten had. Ik zal nog eens een lijstje sturen met ruilmateriaal. Ja, ik heb dat mailtje wel ooit gehad, maar kan het niet terug vinden. Ik raak digitaal meer kwijt dan in mijn hele analoge leven ervoor. Sorrie! Als je het opnieuw wilt sturen, graag. En ik haal onze korrespondentie straks hier weg, okee? Frits, don’t plan on that being soon, as their has got to be, NEW music in Holland that your not telling us about! Have another good ‘Saturday Night’, Alan. Being Canadian, discovery of Herman was a turning point in my music experience. Thanks to folks & sites like this HB may be shared with the rest of the world. Thanks. Today I saw a video on YouTube of a song that one of my favorite musicians, Frank Black, sang in honor of Herman Brood, and it made me curious to know more about this musician. Most of the info I found was in Dutch, so I am very glad to have stumbled across your page. Thanks a million! hey FRITS, you made my day good with this little HERMAN-tune – you must know I lost my mother. she is dead now perhaps jokin´with herman as she was a very strange mother my mother. . . feeds rabbit etc. ähem,,, have THANKS Frits from holland!!! sorry, do you know where to get some more rare stuff from HERMAN? I once interviewz him while he was takin´ a bath after his show…felt in love…alright, support your kids & keep the spirit high! best greetings from ME! 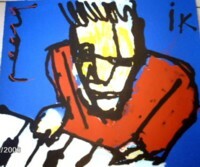 Dear FRITS, can you please post the Herman Brood – Video? I can´t find it anywhere else. Many, many thanx in advance!!! Greetings from bb. Sorry, i have the video no longer. But when i find it again, i will buy it for you. Should be not too difficult.